Prayer is simply talking with God-yet even the disciples asked Jesus to teach them to pray. 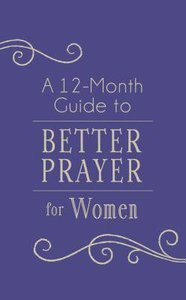 Since then, godly men and women of the faith have given us guidance to a deeper prayer life-and their most insightful comments are included in A 12-Month Guide to Better Prayer for Women. About "A 12-Month Guide to Better Prayer For Women"
Award-winning author and speaker Darlene Franklin recently returned to cowboy country--Oklahoma. The move was prompted by her desire to be close to her son's family; her daughter Jolene has preceded her into glory. ýDarlene loves music, needlework, reading and reality TV. Talia, a Lynx point Siamese cat, proudly claims Darlene as her person. ýDarlene has published several titles with Barbour Publishing.